In the past we have looked at how to take a self shot photograph with the the Samsung Galaxy S2, well another self shoot option is taking a video again using the phones front camera. To do this we need to select the "Self recording" or "Self shoot" option. 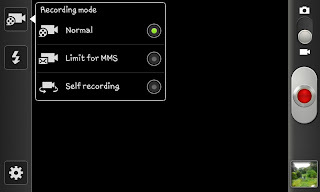 If you start by selecting the "Video camera" mode when you open camera you have 2 options to enable self shooting. The first option is by clicking the video camera icon in the top left corner (as you can see in the picture to the right). Alternatively you can click on the cog icon to open up the settings menu (see below). When you've selected the self shoot option you will see whatever is infront of the front camera (which is on the top of the phone near the SAMSUNG logo). If you press on the record button (the big red one) you will begin to film whatever is in front of the lens, usually, yourself. This isn't as good as the camera on the back of the phone (filming in a locked resolution of 640x480 as opposed to the HD quality of the main camera) though if you're wanting to do a video for something like youtube where you are talking into the camera this is an easier way to do it and see what you're actually filming.